Solar tanks are an integral safety device for every solar heating project. 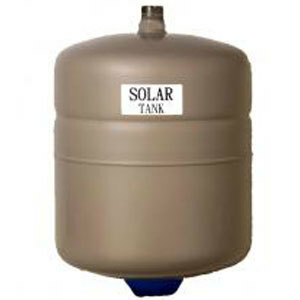 Solar Water Heater Expansion tanks constants the pressure of system and extending the life of all major components. Tanks are buit with an EPDM heat-resistant diaphragm and a stainless connector with patented Leak Safe Technology. The diaphragm has maximum working temperature of 265 F and constants solar fluid at a steady position when it is heated. Depends on system pressure, collector area, system volume and static height of the system we can supply different volume of size. Our New Delhi based company, BDS Engineering sells solar tank for solar water heater. It relieves pressure build-up in the closed loop system. This is beneficial in keeping the consistency in pressure and relieving pressure from the piping, as the working fluid rises in temperature. In order to withstand the high temperature of the solar systems, membranes is fitted in expansion tank. The amount of the fluid used in closed loop can be used for determining the size of the expansion tank. The food grade EPDE diaphragm in the tank is suitable for potable water applications. This tank can be use for pressure regulation. When you will receive a solar water heater expansion tank from us, you will get this pre-charged with some air. There is an inflation valve for increasing or decreasing the charge. The pressure at which working fluid must enter into the expansion tank must be similar to the air charge. As and when the fluid pressure will start to increase, some fluids will enter into the tank and push the air back. This would cause rise in the air pressure. At last, the tank will be filled with fluid completely or reach maximum fluid or air working pressure. We have installed a safety valve for the protection of tank and system.